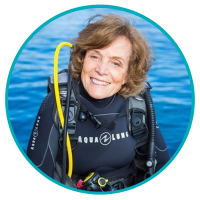 Sylvia Earle is President and Chairman of Mission Blue / The Sylvia Earle Alliance. She is a National Geographic Society Explorer in Residence, and is called Her Deepness by the New Yorker and the New York Times, Living Legend by the Library of Congress, and first Hero for the Planet by Time Magazine. She is an oceanographer, explorer, author and lecturer with experience as a field research scientist, government official, and director for several corporate and non-profit organizations.